A place for comments that would otherwise disrupt sensible conversations. I also have a good science education. I specialised in science from my second year at high school. I got A+’s at university for stage 1 Physics and biology, and I got an A+ for Stage 2 Chemistry Honours (direct entry to Stage 2 Chemistry Honours School from high school). But Alarmists constantly call me a denier, and insist that I am a “science denier”, who doesn’t know any science. I suspect that I am better qualified than most of them, but I am to modest to point it out. Per above, the average transit time for the deep Pacific is 1000 years, and it is expected that the deep Pacific won’t be in equilibrium with surface climate changes over shorter time scales. In other words, humanity is looking at 6C warming every century for the next 1,000 years. To prevent the sixth extinction event, this heat has to be converted to an energy carrier that extracts a portion of the heat from the ocean and converts it to the energy required by 9-10 billion people for use on land. The heat of warming, 335 terawatts annually, converted at 7.5% produces 25 terawatts of primary energy and the waste of this is the heat that needs to be dissipated into space. The 310 terawatts unconverted by negative emissions ocean thermal energy conversion returns to the surface by advection in 250 years at which time it can be driven back down by a heat pipe and converted again into useful energy. Ultimately, over 3250 years all of this 60 degrees is consumed and much of life on Earth is spared. To do otherwise is to invite our ultimate demise. ❶①❶① . . . An open letter to RealClimate.org . . . If Deniers don’t want to be rightly accused of climate denial, then don’t go around denying climate science. The truth is that most of the people who use that term do not restrict it to know-nothings. Anyone who disagrees with even the most tenuous aspect of climate alarmism gets called a “denier” by climate alarmists (often from behind anonymous handles like “t marvell,” “DukeSnide,” “Mal Adapted,” “Al Bundy,” etc.). It doesn’t matter whether the disagreement is based on mere reflexive gainsaying or solid evidence. In fact, most of the people who use that pejorative term also insist, ironically, that there is no such thing as “solid evidence” against climate alarmism. Sea-level continues to rise in some places and fall in others, at rates not significantly different from 90 years and 105 ppmv CO2 ago. 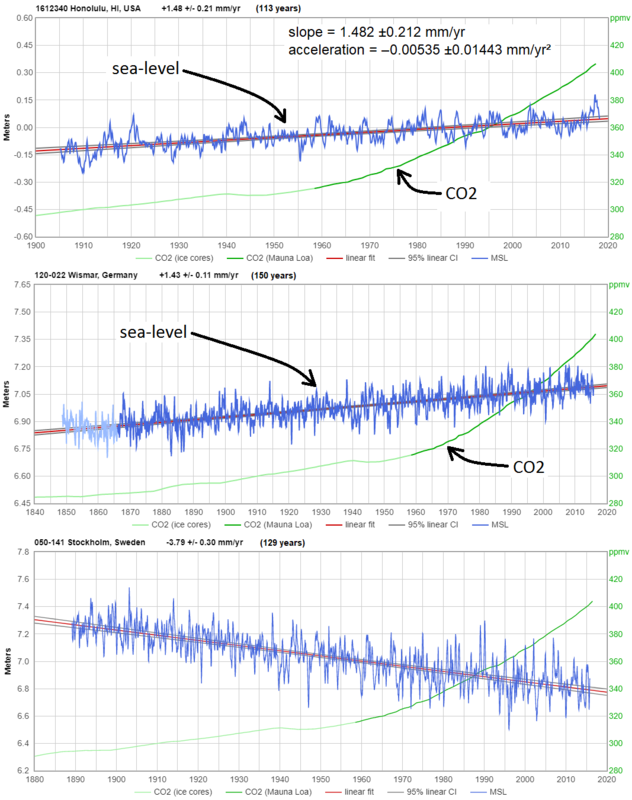 All that additional atmospheric CO2, CH4, etc. has not significantly altered sea-level trends, thus far. (Nor, contrary to Leif Knutsen’s comment, has it caused worsening droughts, forest fires, or storms.) The major effects, so far, are modest & benign warming (mostly at high latitudes, where it makes frigid climates a little bit less harsh), beneficial “greening” of the earth, and agricultural gains. “Valid criticism does you a favor,” noted Carl Sagan, but it takes a big person to be properly grateful for it. Sheldon’s criticism was valid, constructive and gentle, but I’m not detecting any gratitude for it. I wonder if I am a “denier”, a “climate denier”, or a “climate science denier”. Gavin, if a person believes that the danger of global warming is overhyped is that person a denier on that fact alone? Would Europe benefit from a stopping of the Gulf Stream? Since the northern part of the NH is warming faster than any other place, why does Europe need heat from the Gulf Stream? Perhaps the stoppage is a good thing? Last I heard Europeans were dying like flies a couple of summers ago in the extreme heat. The Science and Mathematics of Earth’s Temperatures. Including this one! Lol! You guys crack me up. No, I post here to inject a measure of common sense into the proceedings. But I have to admit, I do enjoy getting all you guys so riled up. It amuses me to see how so many of you can write so much without actually saying anything. And all the feeble attempts at bullying make me feel like I’m back in eighth grade. Nostalgia. Now as to the deep inner meaning of the phrase “cooling down,” seems to me that when we have a year that’s cooler than the previous three, it’s accurate to see that process as a “cooling down.” The notion that this phrase implies a cooling trend lasting beyond that year is pure assumption, a spécialité de la maison in these parts. And yes, “the sun’ll come out tomorrow.” I knew that. But knowing the sun will come out is NOT the same as being able to predict the climate. Most people know that too — but not Al Bundy. If things get warmer over the next few years, Al will take that as proof he was right. And if things get cooler, he’ll find a way to get around that by invoking various “natural forcings” that distorted an underlying warming trend. That’s how “science” works, no? And yes, the “hiatus” from 1998 through 2015 remains, regardless of anything that happened after that. Just as the hiatus from 1940 through 1979 remains, despite the temperature rise that took place over the following 20 years. Once again you folks are assuming I don’t know what I’m talking about, because you see what you want to see and ignore all else. The definition of confirmation bias. To predict how climate change/global warming will affect a country, you need to know what the country’s current temperatures are, for the average hottest month, the average month, and the average coldest month. How many of the children who are taking a holiday from school, to protest about climate change, know what Russia’s average temperature is? I am guessing, not many. If you told them that Russia’s average temperature was +0.2 degrees Celsius, how many would have enough science and mathematics knowledge, to say whether that was hot or cold (especially American children, who are not familiar with Celsius). How many of the children who are taking a holiday from school, to protest about climate change, know that Russians live at an average temperature, which is near the freezing point of water? How many of the children who are taking a holiday from school, to protest about climate change, know that the average coldest month in Russia (the coldest winter month), is -21.1 degrees Celsius (yes, that is MINUS 21.1). How many of the children who are taking a holiday from school, to protest about climate change, know that Russian children are also taking a holiday off school. To demand that the world increases global warming, so that they can survive in the future. Can you see that big booger on the end of your nose? We have it on authoritative authority of a US Congresspersonage that the world will end in 12 years (now 11y 10m). Thus, there’s really no need to do anything, because no actions taken now will have any significant effect within that time. The driver of this shift is core mantle boundary geomagnetic shift. I think, after 20 years work. Climate scientists claim to be able to make a radiative budget of the whole Earth, but they are not even able to make a radiative budget for a single molecule, or for the collision of two molecules. They still rely on the “ghost photon” theory of the bohrian atomic model, which is an oversimplification of what really happens when a photon collides a molecule. Moreover they confound absorption of infrared energy with global cinetic energy and with thermic energy… Three very different things with different causes and different results. Thus, they believe in the existence of atmospheric effects that don’t even exist in reality. Sad, but true. Why don’t you let “cranks” post their theories directly on “The Crank Shaft” thread? I have a theory, that if you wrap a climate scientist in tinfoil, then they can no longer deny absolute temperatures. What are the two scenarios pertaining to the global mean temperature in the Earth Energy Budget ? The best case is found by removing all the fluxes that are not radiative (yes, don’t ask me why, but strangely, they mix radiative and non radiative fluxes in their radiative theory…). And doing so, the Earth Energy Budget predicts an actual global mean temperature of 65,8°C or something near, if I recall correctly. Then, the worst case is by including all the fluxes at ground level, even the non radiative ones, let’s do like them ! And what does one find ? A temperature superior to 90°C, dangerously approaching the ebullition point for water ! The IPCC claims that climate scientists have an incertitude of tenths of degrees for the temperature in an hundred years… but in reality they have an incertitude of tens of degrees on the prediction of the actual temperature ! Either way, only a fool would base economy-destroying policy on the recommendations of climate scientists.